Our experts can dry your basement and get it ready to make the most of your remodeling investment. To schedule a free basement upgrade quote, contact us by phone or e-mail today! Our experts serve throughout the Pennsylvania area, including Saint Marys, Bellefonte, Altoona, State College, Du Bois and nearby. At Bowman Masonry & Waterproofing, we've seen just about everything that can happen to a finished basement, and we've been called in to waterproof them daily. Once the basement is finished, repairing and waterproofing the space is much more expensive. The systems we install at Bowman Masonry & Waterproofing also include an alarm system that sounds off in the unlikely event of a pump failure -- so you can respond right away. If you don't turn off the water every time you do the laundry, your washer hoses may be a ticking time bomb for a flood. Replace these old hoses with heavy duty washing machine hoses for a little extra peace of mind. 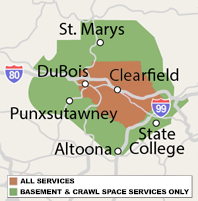 Our experts proudly provide free quotes to the Pennsylvania area, including Du Bois, State College, Altoona, Saint Marys, Bellefonte, the surrounding areas of Kersey, Port Matilda, Tyrone, Pennsylvania Furnace, Ridgway, Brockway, and nearby.